Thread: Great Bobbin Holder ! I just saw this and thought it was a great way to keep wound bobbins organized ! These are toe separators used for pedicures. I try to wind several bobbins for my projects and they actually keep them from unwinding. I like it ! Cute idea, thanks for posting. And look how cute they look! Wow what a great way to use this!!!! !, gonna have to try it myself!! Great idea. I was just whining today about my bobbins. This might be the solution! Thanks for sharing. I;ve used these for awhile now ... to help me keep track of the threads, I then label the "holders" with the type/brand of thread. Duh. Why does everyone else always think of these things? 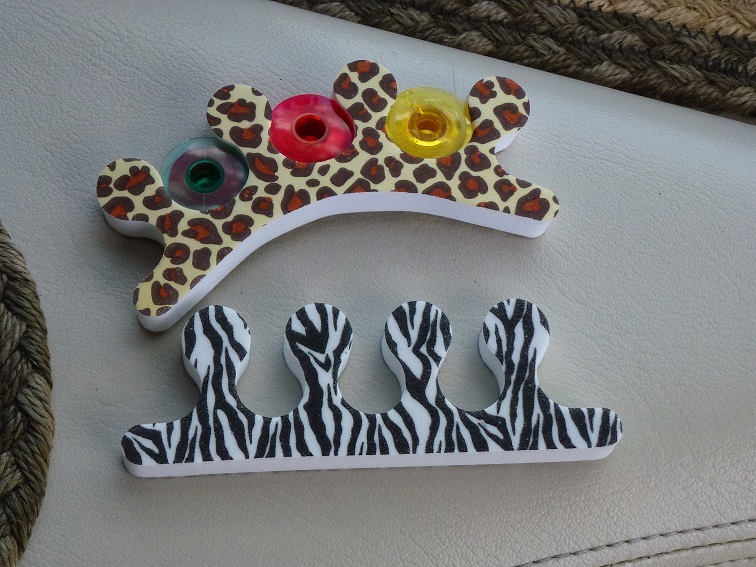 I have bobbins and toe separators and never once thought of putting them together! Great plan. What a fantastic idea always have trouble with the unwinding bit. Another good one ... use those little scrunchy elastics ... you can get a gazillion of them at the $ $tore for a $ !!! Too bad we don't have more toes! What a cute and neat idea! Where did you find the toe separators with such fun prints on them? One of the dollar stores? Thanks for sharing! Great. I have been throwing them away. Now I will keep. What a great idea and cute patterns, to boot! Great idea, and those are very cool multi colored bobbins !!! I keep my bobbins in empty altoid tins. They fit wonderfully. I use the tiny hair elastics (okay, they're not really elastic but they are stretchy circles) to keep the thread from unwinding. Love my tins. They stack nicely and take up a lot less space than toe separators. They are so cute, who woulda thought! It's a great idea to keep wound ones near by while working on a project, I will have to get one, hope I can find the leopard one. great idea...I have a bunch of those things laying around. Interesting. I used to use the little fuzzy scrunchies, but you can't see the color of the thread with those on. I'd end up spending half an hour, taking them off and putting them back on just to find the right color. So I went to the hardware store and bought about a foot of clear plastic tubing. Cut little slices off the tubing, cut a slit in the slice. They slide right on and I can see the thread color through the tubing. Good idea .. thanks for sharing !